Thirteen years ago we were one of a handful of exhibitors at the first (would it be annual?) Vegetarian Festival on the downtown mall in Charlottesville, VA. We didn’t know what to expect but we put together a quick exhibit on the spiritual reasons behind vegetarianism. 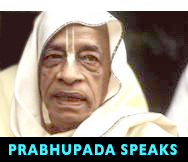 We talked about karma (what goes around comes around) and how each living entity is, in fact, an atma (soul). We expressed that we have no right to cut short the life of another living being just to satisfy a craving for a “taste” we have been conditioned to enjoy and associate with opulence, and social events (tail-gating, grilling in the back yard, a steak dinner, hotdog at a ball game). We expressed the fact that all those activities can be enjoyed without killing innocent animals, and that eating meat is not necessary. In fact, a vegetarian lifestyle is better for us both spiritually AND physically. We didn’t know how the message would be received. But it was received well, as was the festival as a whole. Charlottesville is, after all, a progressive community and the festival was appreciated. This year marks the 13th year of the Festival. It is a free, outdoor celebration promoting a healthy and humane lifestyle that brings together diverse individuals and organizations who want to make the planet a more healthy, sustainable, and compassionate place for all to inhabit and enjoy. 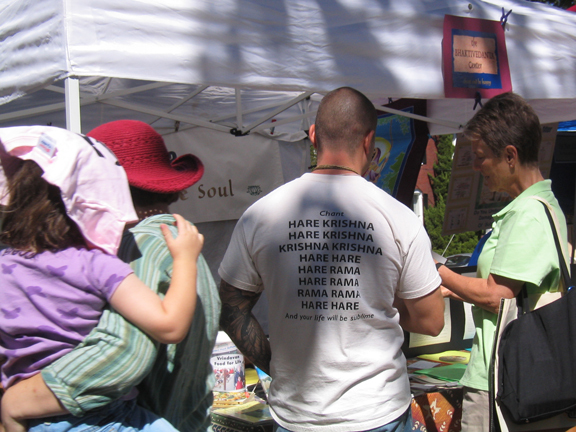 One of the largest vegetarian festivals in the United States, this one day event typically draws about 6,000 visitors. The CVF features a wide variety of vegetarian foods showcasing many of the vegetarian offerings of local restaurants. Free vegetarian food samples from natural-foods companies are also available. In addition to restaurants and food vendors, the approximately 100 exhibitors/vendors hosted by the festival also include compassionate-living advocates, nonprofit and educational organizations, local green initiatives, environmental concerns, and animal rescue organizations conducting an Adoption Fair for dogs and cats. There is a “Kids’ Patch” for children, and a wide variety of other activities and musical programs are offered. 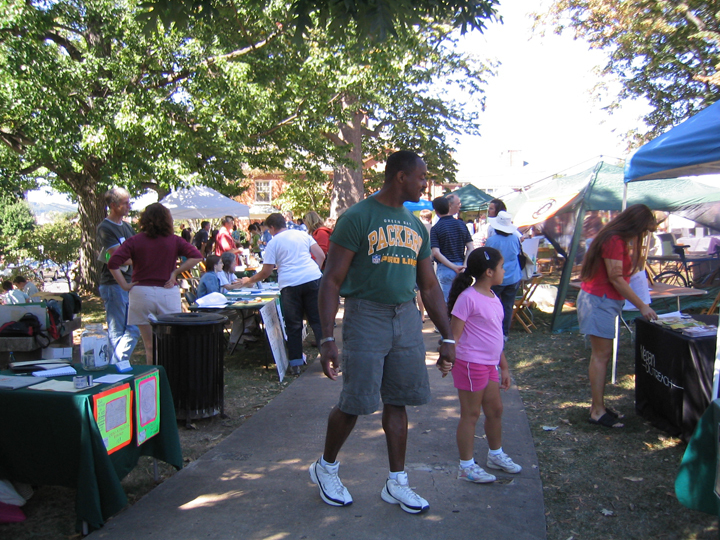 The 13th annual Charlottesville Vegetarian Festival (CVF) will be held — RAIN OR SHINE — on Saturday, September 26, 2009 from 11:00 am to 4:00 pm in Lee Park. 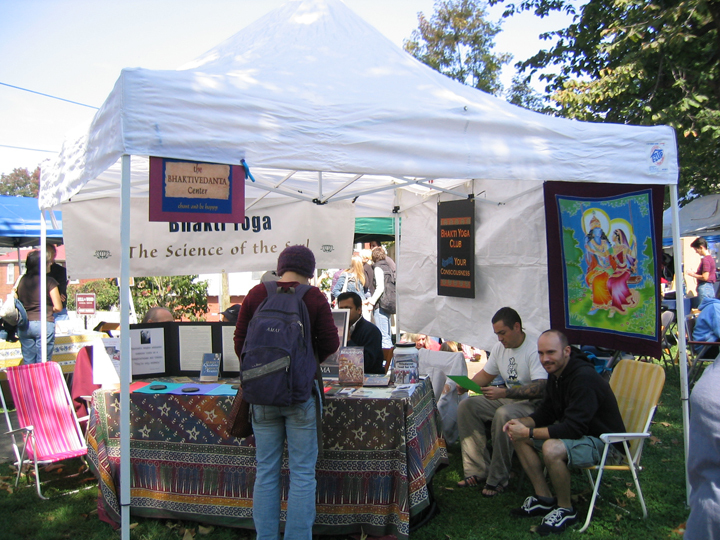 Look for the big Bhakti Yoga banner! We hope to see you there!